Nyssa sylvatica ‘Wildfire’ is a single stem tree with an attractive pyramidal shape in youth, a more rounded form in maturity, and striking foliage. Its fall colors are stunning, with oranges and reds. 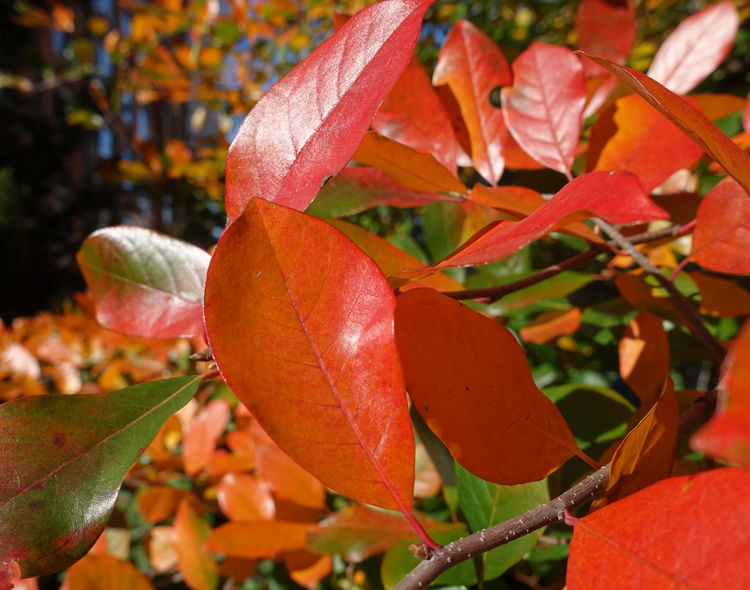 New growth throughout spring and summer is of a bright red, while mature leaves are a deep, glossy green. On the High Line we grow both the straight species and the Wildfire variety which exhibits the red new growth. Nyssa is native to Eastern North America, being hardy in zone 4 (Maine) to zone 9 (Florida). In the wild, black tupelo, also known as black gum, can grow in a wide range of habitats including mountain ridges and river margins reaching from 30 feet to more than 50 feet in height depending on sun exposure, space, and water availability. The small, greenish-yellow flowers are almost unnoticeable, but they do attract pollinators and birds that feed on them. Female and male flowers appear on different plants, although there are some cases where one tree has both flowers. There are no serious diseases or insect problems, although the tree is susceptible to leaf spots caused by bacteria and fungi that can compromise the beautiful foliage. Other potential problems include the larval stage of the tupelo leaf miner that causes damage in August and September. Black tupelo is a versatile tree, growing in a wide range of places, but it does not like alkaline soils. Considering planting sites is very important because it can grow too much and cause problems. Think power lines and city backyards. In larger areas it will grow to be magnificent trees. The taproot makes it very difficult to transplant black tupelos, so it is not the most appropriate tree for growing in containers. Muhlenbergia capillaris can be seen at the Washington Grasslands at 13th Street and the 11th Avenue Bridge.